Last year I visited the least used stations in Berkshire, Hertfordshire, Greater London, Essex, Bedfordshire, Surrey and Buckinghamshire. Last weekend I picked off the least used station in Kent, which has even fewer passengers per year than any of those, but ironically a better service. Two trains an hour stop at Swale, even on Sundays, which is amazing when you consider it's properly in the middle of nowhere... at the only bridging point between the Isle of Sheppey and the mainland. Why would anyone get off the train here? I went to investigate. Before the Sittingbourne & Sheerness Railway arrived, the only way off the Isle of Sheppey was by ferry. In 1860 they built a lifting bridge across The Swale at King's Ferry, carrying both rail and road, and in 1913 opened a private halt on the south bank to allow staff operating the bascules to commute. In 1922 a Norwegian cargo ship collided with the bridge, rendering it inoperable for a year, so Kings Ferry Bridge South Halt was opened to the public and a temporary ferry service reinstated. 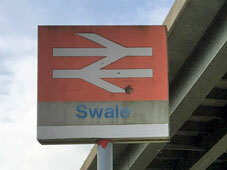 After the bridge was repaired the trains still stopped, and in 1929 the station was renamed Swale Halt. 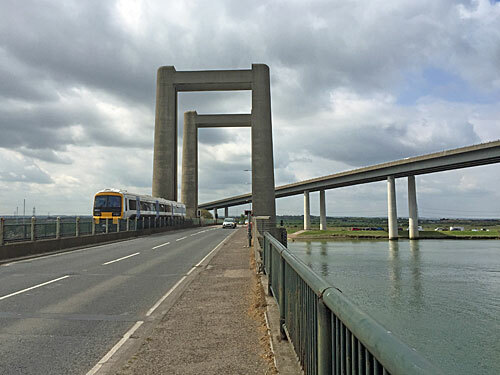 In 1960 a more modern lifting bridge was installed, but this eventually proved inadequate for the amount of road traffic using it, so in 2006 a swish dual carriageway was opened alongside. I'd been deposited on a long curving platform with sufficient space for an eight car train, not that anything longer than two ever stops. A string of lampposts led off round a concrete wall to the south, there was nowhere to sit, and the view was of distant docks and pylons across desolate open marsh. There was no major reason to hang around. A signal pole blocked the northern end of the platform, where a Way Out sign led down a brief ramp to an unexpected bus stop. As this is the only route off the island an amazing seven different bus routes stop here, only one of which runs regularly, but enough to provide a decent alternative means of public transport at this 'inaccessible' spot. 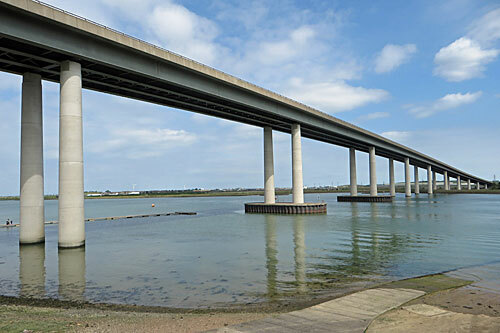 Dominant above all other is the A249 Sheppey Crossing, shadowing road and railway and rising steeply above them, stalking the landscape on thick concrete stilts. A small commemorative plaque on a nearby pillar recalls that the new crossing was opened by a government minister "in the presence of local resident Mr R Grimwade", with Reginald being the lucky octogenarian who won a competition to name the bridge. Immediately above is also the site of Kent's worst road accident this century, when 130 cars collided one Thursday morning in freezing fog, because streetlamps are expensive so nobody knew what they were speeding into. A mile and a half to the south is the village of Iwade, which you wouldn't walk to after dark, but might bike if only there was a cycle rack at the station, which there isn't. Half a mile to the east is Ridham Dock, a significant industrial hub, and also setting off from here is a public footpath which commits ramblers to a trek of at least four miles should they choose to set out. Much closer on the southern bank is the Kingsferry Boat Club, boasting 50 estuarine moorings and a generator to power the trolley winch and kettle. Most members drive in, as the impromptu car park under the bridge testified, but this facility is all that's really keeping rail passenger numbers afloat. Indeed this is a proper watersports hub, even unofficially so, as north Kent and Sheppey residents head out into safe water for a gadabout. Two mini hovercraft were beached when I arrived, before being skudded out onto the Swale by their owners, which looked a whole lot of fun. Meanwhile the opposite banks were teeming with kids and their extended families on scrambling bikes, roaring in hordes across the marshes, or pootling safely well out of the way. As I approached their temporary camp a bloke wandered over and casually engaged me in conversation regarding the legality of the exercise, heading off once convinced I wasn't The Law, then quad-biking into the distance. The SKLR is all that's left of the steam railway serving Ridham Dock, an amateur enterprise battling against infrastructural decay, triumphantly shuttling two miles against the odds. 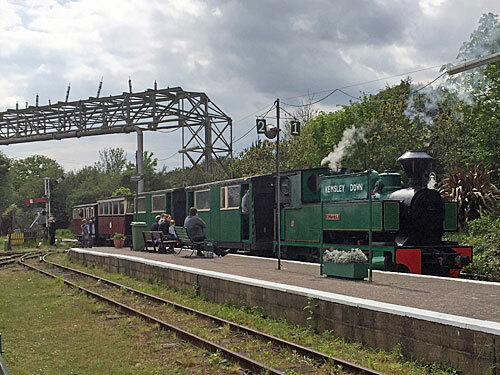 Kemsley Down station is a proper railway oasis, overseen by cheery volunteers, with an hourly service on Sundays from Easter onwards (and three days this weekend, if you're interested). 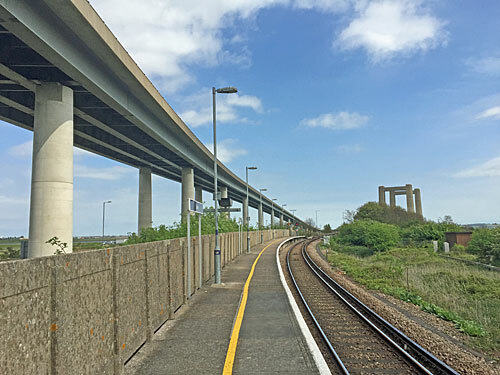 The view from the train's not especially scenic, and includes Asda and the local tip, but the literal high point is the 100 year-old 883m-long Sittingbourne Viaduct, which snakes low above the industrial estate before pulling into a halt hidden behind the town's KFC. I bet they see more passengers a year than Swale, or at least I'd like to hope.